Alexandra Weston brims with delight as her eyes lock on to a blue and black clutch on display in Holt Renfrew’s in-store shop, the H Project. “These came in,” she beams, magenta lips spreading cheek to cheek. She explains the clutch is from Mercado Global, a social enterprise that works with indigenous artisans in Guatemala, helping to build businesses and connect with international markets. “And they have a whole series of different givebacks — social empowerment, education — that go along with their brand,” adds Weston, director of brand strategy at Holt’s. While esthetics are important (this is Holt Renfrew, after all), it’s this charitable component that is crucial for Weston. She’s on a philanthropic retail mission, one that’s all about the story behind the product. It’s a bright and clear October morning as Weston, dressed casual chic in head-to-toe black, guides us to a quiet table in the back of Holts Café at the high-end retailer’s flagship location on Bloor Street. Equally well-dressed patrons begin to filter in and, considering the exclusivity of the Holt’s brand, it becomes increasingly clear I’m likely the least important person in this room. But Weston’s humble warmth eases any anxiety. There’s this almost tangible niceness glowing from her, a sensation that makes you forget that you’re sharing a table with a member of Canada’s unofficial royal family, the better half of heir apparent to the Weston kingdom, Galen Weston Jr. It’s a genuine kindness that blossoms further as she opens the book of her soulful retail tale. Each year, Weston and her team unearth these stories firsthand by collaborating with designers on the H Project’s Uncrate initiative, which highlights distinct cultures and their artisans. In 2014, they connected with Waris Ahluwalia for Uncrate India. Earlier this year they took a similar excursion to Africa, teaming up with the likes of designers Jodie and Danielle Snyder, the aforementioned Lauren Bush Lauren and Grammy-nominated recording artist John Forté. They met with local co-operatives in Kenya and Rwanda to find handmade jewelry, clothing and accessories they could retail in Canada. But it’s the stories they brought back that hold the real weight. Weston recounts walking the slums in Nairobi, Kenya, with Simone Cipriani, an officer of the United Nations and creator of the Ethical Fashion Initiative, and Italian designer Stella Jean. They sat down with a man named Vincent, who was born and grew up in the destitute region. Scars from stab wounds offered a map of the hardship of his upbringing. But Vincent’s story is no tragedy. He now has his master’s degree and works with the UN to help others like himself find a better life beyond the perceived hopelessness they seem destined to endure in the slums. “He’s just this incredible beacon of hope,” Weston adds. Favourite wool item for the home in the H Project? One wool item you shouldn’t be without? But you don’t need to fly halfway around the world to offer a helping hand. One initiative that the H Project has continuously supported is the Prince’s Charities’ Campaign for Wool. This global mission was founded by the Prince of Wales to generate awareness to the benefits of wool — its versatility as a fabric, its financial support to rural communities, its sustainability — and to revitalize the dwindling industry in Canada and the 11 other countries where the program runs. Holt Renfrew hosts an annual pop-up in the H Project during the campaign’s Wool Week, displaying blankets, scarves, hats and more made of Canadian wool, some produced as close as Prince Edward County. 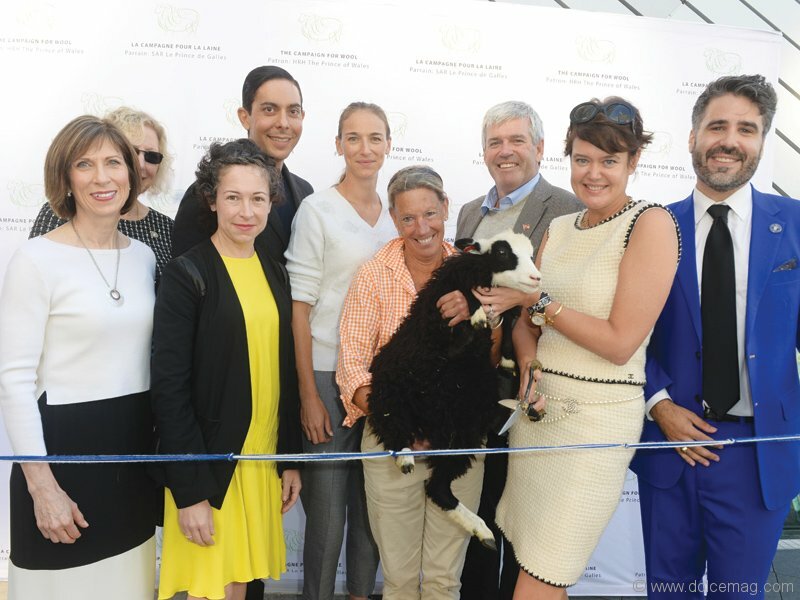 “Without their support the Campaign for Wool would not be a fraction of what we’ve been able to build in these last few years,” says Matthew Rowe, director of operations and partnerships for the Prince’s Charities Canada. Rowe explains that by providing a platform for Canadian wool products in the luxury market, Holt’s has not only created awareness for this environmentally friendly fabric, but also revenue to allow this struggling industry to find footing. It’s now a question of whether this idea will transition into the mass market. When you hear the passion in Weston’s voice, it feels like it’s more than just a possibility. And if she can help make that happen, it would make for one heck of a story.